The Condor Outdoor Chest Panel is the perfect option for the player who wants the most high speed, low drag rig possible. 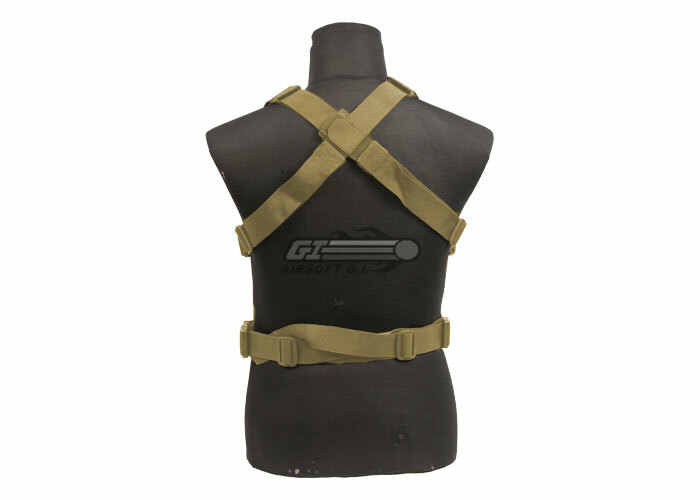 It is secured to the user by the two shoulder straps that cross over across the back and the adjustable waist strap. All of the straps are fully adjustable, ensuring that this chest panel will fit players of most any size. The top of the panel has a map pocket so that you can carry your essentials, and the front features just enough MOLLE space to hold the pouches that you will absolutely need in battle. If you're looking for the most low profile rig possible that will allow you to carry just what you need and nothing that you don't check out the Condor Outdoor Chest Panel. this product is a very nice and light weight rig! this thing is very small and it is only 4 rows of molle up and about 7 or 8across, including the top row of velcro molle which is nice for patches. the whole rig is a pouch and can hold a plate...? maybe? I am not completely sure! But if you are small like me this thing WILL fit you! I am 5'3 and 106 lbs. and my waist size is about 28 inches and this thing fit! I like rigs that sits high on your chest. 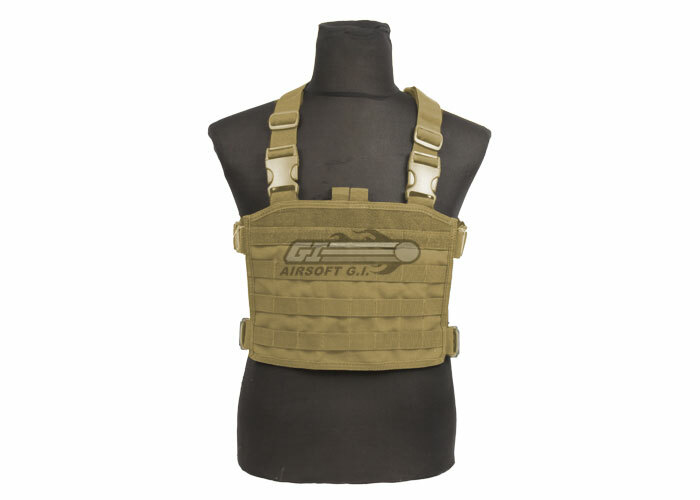 I have nothing against the other condor molle rigs that are on your belly but this thing can fit as high as a vest it about 3 inches from your shirt line when put on so you can get it pretty high which is perfect for battle belts which I have. Backpacks are compatible and highly suggested! for $20 bucks this rig is AMAZING, and you cannot pass it up!! please remember this thing is TINY! which I like this is for smaller players! I would not recommend this for people who want lots of mag you can fit maybe fit 6 mags double stacked on this rig. I use this for my MP5 and its amazing! Mag pouch well and still have patch room. Its made of pretty good material and the buckles are not gonna break on you any time soon. Thats it! 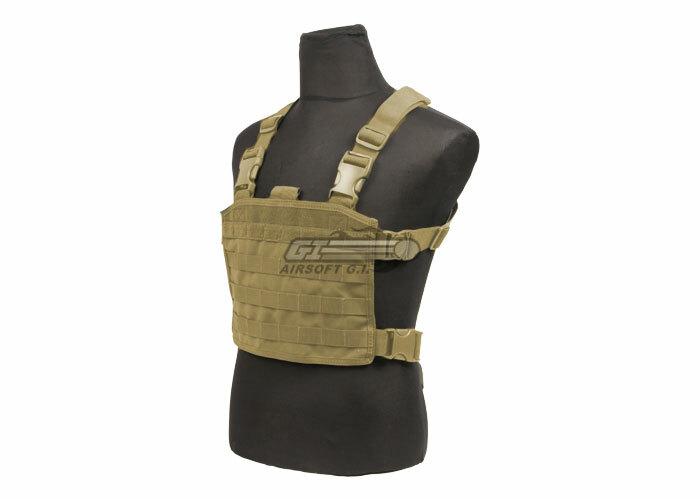 This chest rig is a very very good chest rig for 25$! I am officially in an Emergency Services Auxiliary of the USAF. This is a great panel for both airsoft and real life. I use this for hands on search and rescue equipment. This is perfect, because it small and compact, but can carry exactly what you need in gameplay. You can carry everything, and move as quickly as if you did not wear a vest. It is worth it. will this fit a 12 year old? Is this a khaki or more of a coyote brown?